PORT HARCOURT, Nigeria (February 10) - Adama DIATTA (SEN) ventured to Port Harcourt with aspirations of capturing his eighth African title. The two-time Olympian outscored his opponents 21-3 on his way to his ninth finals. In the 61kg finals, Diatta controlled Chedli METHLOUTHI (TUN) for the entire match, sealing his 5-2 victory late in the second period with an underhook throw by to a single leg. At 57kg, three of the top-four placers from a year ago returned to this year’s African Championships. 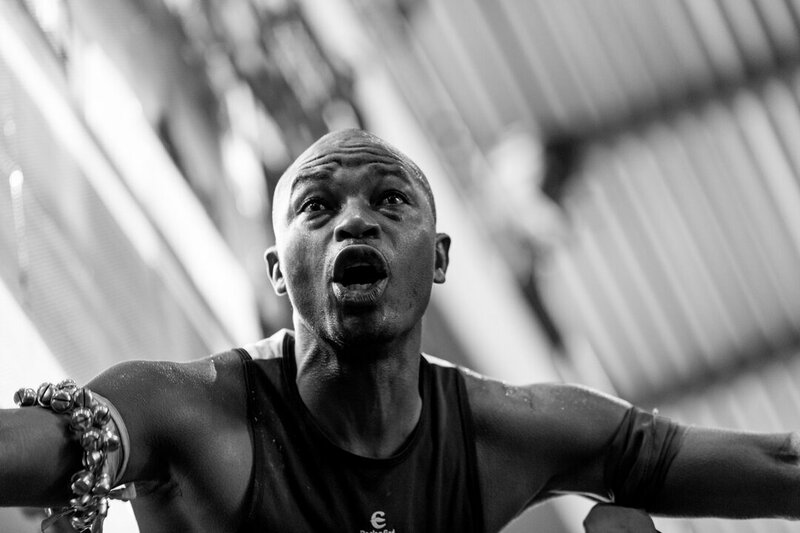 Ebikewenimo WELSON (NGR), the fourth-place finisher from a year ago and Jan Louwrens COMBRINCK (RSA) stopped Chakir ANSARI (MAR) and Abdelhak KHERBACHE (ALG) from making back-to-back finals. In the finals, Combrinck found himself down 4-0 after giving up two early takedowns. He narrowed Welson’s lead to 4-2 after picking up a takedown of his own. Shortly after his first takedown, Combrinck picked up a throw and eventually stuck Welson late in the first period. Amas DANIEL (NGR), Nigeria’s world team representative in 2010 snagged the 7-2 win over Haithem DAKHLAOUI (TUN), the 2017 African Championships fifth-place finisher after securing three takedowns and a point for a lost challenge in the 65kg finals. Reigning 70kg champion Ogbonna Emmanuel JOHN (NGR) thought his hopes for back-to-back titles were derailed after six minutes of wrestling. The scoreboard showed Amr HUSSEN’s (EGY) named underlined after a 2-2 battle, but that was incorrect. John scored a two-point move, and Hussen scored two one-point moves, which gave John the lead on criteria and his second African gold medal. Ayoub BARRAJ (TUN), the African junior champion from a year ago picked up two one-point scores on the way to defeating Sami Hamdi AMINE (EGY) for the 74kg title. Moving to 79kg, Ekerekeme AGIOMOR (NGR) dominated the match from the first whistle. He took a 7-0 lead into the second period before picking up a pair of takedowns to defeat Fredylan George MARAIS (RSA), 11-0. Melvin BIBO (NGR) improved on his 2017 African Championships third-place finish by not only making it to the finals but by picking up a 10-0 technical superiority victory over Hein Jakobus JANSE VAN RENSBURG (RSA) in the 86kg gold medal bout. Hosam Mohamed Mostafa MERGHANY (EGY) picked up the 3-0 win over Robert DAUFA’s (NGR) in the 92kg finals by snagging a shot clock point and picking up a takedown late in the second period. Martin ERASMUS (RSA) did something that not a lot of people expected. 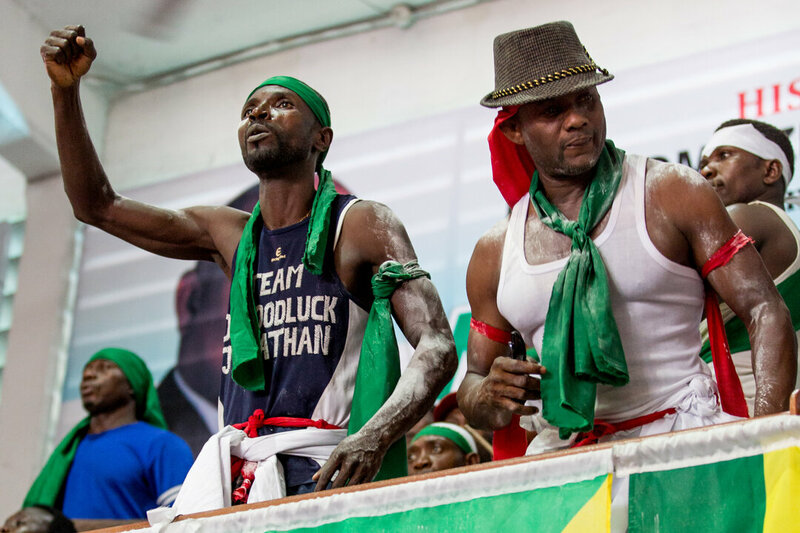 He defeated the man who had ownership over the 97kg weight class for the last several years, Soso TAMARAU (NGR). In winning his first African gold medal, Erasmus denied the reigning champion from winning his third African championship. Concluding with 125kg, Khaled ABDALLA (EGY), African junior champion from a year ago held off two late flurries from Olympian and three-time African Champion, Sinivie BOLTIC (NGR) to win 2-1. GOLD - Ekerekeme AGIOMOR (NGR) df. Fredylan George MARAIS (RSA), 11-0. GOLD - Martin ERASMUS (RSA) df. Soso TAMARAU (NGR), 1-1. PORT HARCOURT, Nigeria (February 9) - The African cadet and junior championships concluded today in Port Harcourt, Nigeria. 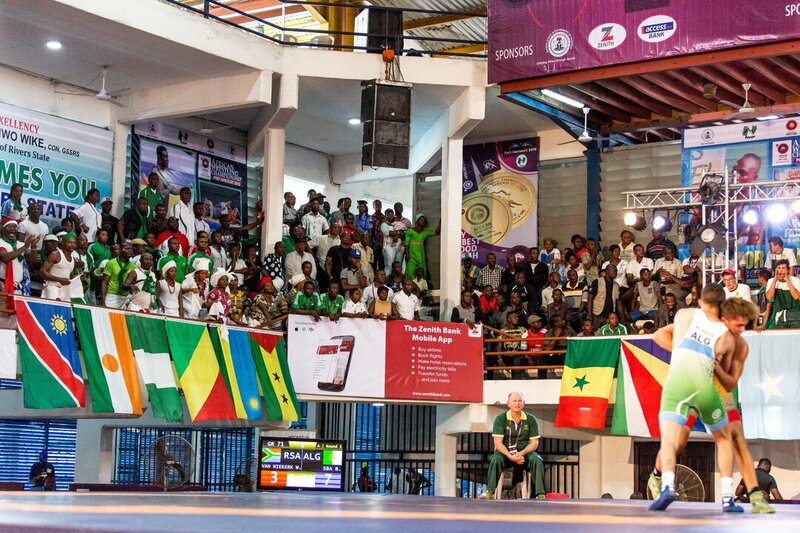 Nearly 250 age-level wrestlers from 14 nations competed in this year’s African Championships. Mercy Bolafunoluwa ADEKUOROYE (NIG), who is the niece of reigning world silver medalist and United World Wrestling’s History Maker of 2017, Odunayo ADEKUOROYE (NGR) took home the 53kg gold medal after she defeated Souad Malek BOUKSIR (ALG), 10-0. Nigeria finished the day with two additional gold medals, bringing their total to three gold medals. Morocco, Egypt, and Tunisia each had a solo gold medalist. The four remaining weight categories did not have entrants. This is Manuel. 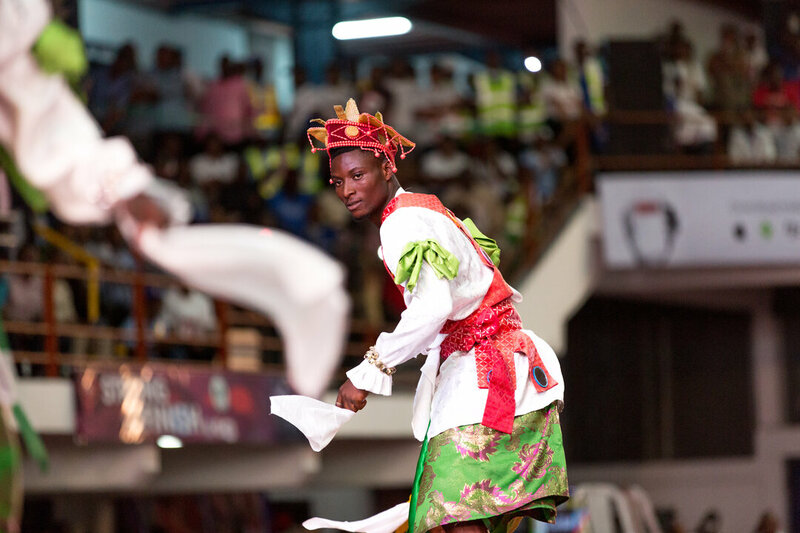 He is a huge Nigerian wrestling fan and has been dancing and singing all day everyday here at the African Championships. After Ebizimor Daukeyai Kelvin SARIKI’s (NGR) 8-2 victory over Decan Lukeem JANTJIES (RSA) in the 45kg finals, South Africa took over the gold medal parade by winning back-to-back titles at 48kg and 51kg. Algeria’s picked up the first of its two gold medals at 55kg when Oussama LARIBI (ALG) completed the 14-4 technical superiority victory over Adham Mohamed Abdelmonem Ali SAKR (EGY). At 60kg, Stephen Tope AKINTEWE (NGR) narrowly edged Alex Foday KALLON (SLE), 2-0, giving Nigeria their second gold medal of the cadet freestyle championships. Fathi Tarek Fathi Attia ISMAIL (EGY) went unscored upon on his way to defeating Kenechukwu Prince NNAEMEKA (NGR), 6-0 in the 65kg gold medal bout. At 71kg, Christian GUIDILIM (CMR) went 4-0 on the day and gave Cameroon their first medal of the 2018 African Championships. Chadi EL KHALIL (EGY) and Ahmed Mahmoud Elsayed Mohamed KHALIL closed out the tournament for Egypt, winning two of the three remaining gold but not before Algeria’s Fateh BENFERDJALLAH (ALG) picked up the 80kg title. Abdalla Mohamed SHAABAN (EGY) started out the Greco-Roman portion of the tournament by squeaking out at 3-2 victory over Omrane CHERRAD (ALG) at 48kg. Peter UKORO (NGR) captured the host countries lone cadet Greco-Roman gold medal by shutting out Omar Adel Elsayed Gaafar ABDELAZIZ (EGY), 4-0 at 55kg. Tunisia will head home with three champions, including back-to-back gold medalists at 65kg and 71kg with Lamjed MAAFI (TUN) and Mohamed Aziz LANDOLSI (TUN). Mehdi JOUINI (TUN) also took gold at 51kg . Algeria’s trio of Mohamed Yacine DRIDI (ALG), Ahmed Abdelhakim MERIKHI (ALG), and Fadi ROUABAH (ALG) also captured three gold medals for their nation. Those gold medals came at 51kg, 60kg, and 80kg. The competition did have entrants at 110kgs, so the final gold medal went to Egypt’s Shady WAHEEB (EGY) as he defeated Mundell BROWN (RSA) by technical superiority victory, 14-4. 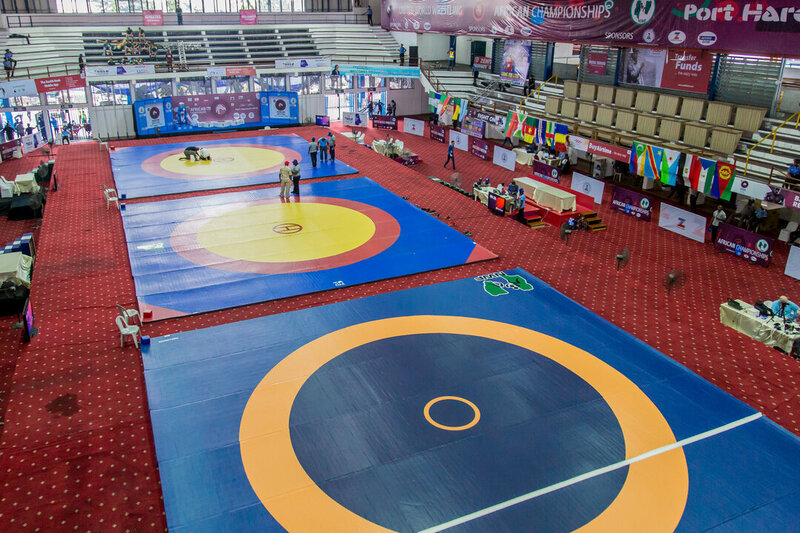 The first two matches of junior freestyle side of the tournament started with criteria wins. Beginning with 57kg, Gamal MOHAMED (EGY) was able to hold off Salah Eddine KATEB (ALG), 5-5 and pick up the gold medal. One gold medal bout later, Frederik NORTJE (RSA) stood his ground and beat Kouceila SADOUKI (ALG), 4-4 to seal up the 61kg gold medal. Algeria would pick up their second gold medal in freestyle as Fares LAKEL (ALG) handed Kaireddine BEN TELILI (TUN) a 9-6 loss in the 65kg finals. Nwafor EMEKA (NGR) gave Nigeria their first junior freestyle gold medal as he picked up the commanding 10-0 technical superiority victory over Mohamed Aziz BEN JAAFAR (TUN) at 70kgs. At 74kg, Samy MOUSTAFA (EGY) added to Egypt’s gold medal count with a 10-0 victory over Matthew Trevor BARTLETT (RSA). Oussama ABDELLAOUI (ALG) made it a trio of gold medals for Algeria as he completed the 5-0 shutout over Ebiboloukemi Gilbert CLARKSON (NGR) at 79kg. After finishing the day with two wins, Tarikebena CAPTAN (NGR) and Omar Hussein Mohamed Hassanin ZAYED (EGY) walked away with the 86kg and 92kg gold medals. At 97kg and 125kg, Mohammed FARDJ (ALG) and Radiance Best AKARI (NGR) finished the day with 1-0 records and took home African Championship crowns. Algeria kicked the off Greco-Roman wrestling with back-to-back champions at 55kg and 60kg. Mourtada NAANAA (ALG) held off Abderrazak ROUINBI (MAR), 1-1 to win the 55kg title. Abdeldjebar DJEBBARI (ALG) won both of his matches and walked away with the 60kg crown. Egypt followed suit, taking home the next two gold medals. Hassan MOHAMED (EGY) shutout Radhwen TARHOUNI (TUN), 9-0 in the 63kg finals, and in the 67kg finals, Mohamed ELSAYED (EGY) picked up a technical superiority victory over Mustapha AFIRAOU (MAR), 12-1. The final six gold medals were determined via round-robin. Egypt captured four of the last six weight classes with three gold medals. Nigeria and Tunisia grabbed the final two gold medals. 50kg Sarra HAMDI (TUN) started the gold medal festivities for Tunisia by handling Nada Medani Ashour Abdalla MOHAMED (EGY), 16-5 in the 50kg finals. Tunisia went on to win gold medals at four additional weights, bringing their championship hardware to five gold medals. Rosine NSTA ASSOUGA (CMR) gave Tunisia a rare finals loss as she edged out Siwar BOUSETTA (TUN), 4-2 to capture the 53kg African championship. At 62kg Lina KHELLAL (ALG) went 3-0 on the day was awarded the gold medal. With no participants at 76kg, the tournament concluded with Ebi BIOGOS (NGR) winning the title at 68kg and Youin AMY (CIV) taking home the gold medal at 72kg.